September 2, 1916. One of the two creators of Fantomas, the master of crime, has been visiting in America. Marcel Allian, who wrote the great French detective novels in collaboration with Pierre Souvestre, has just sailed for France after seeing the entire Fantomas series, as the pictures will be released by Gaumont through Mutual. While he had seen them when they were made at the Paris studios, he lost none of his enthusiasm for them when he saw them edited for the American market. The Mutual’s new series of Gaumont productions will be released under the title of Fantomas. It is based on the exploits of a notorious Paris criminal. It will be presented in five releases of three chapters each, the first of which will go out on September 7. A noted company of artists are included in the big cast and thrills enough to satisfy the most capricious have been injected into the various scenes of the five episodes. 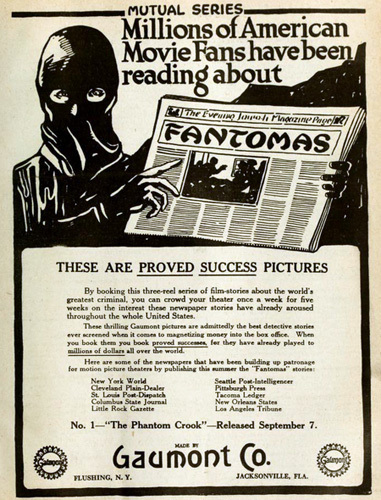 The stories of Fantomas have been running in hundreds of the large papers throughout the country, with a combined circulation of millions daily. Questa voce è stata pubblicata in Cronologia 1916, Film, Noleggio e contrassegnata con Gaumont, Louis Feuillade, Mutual Film Co.. Contrassegna il permalink.